Whim Separator - Bunting Magnetics Co. Wet high intensity, high gradient WHIM separators are used for the continuous extraction and concentration of fine paramagnetics (less magnetic material) presented in a wet state. They are used when a material cannot be separated in a dry state. WHIM units can be designed as single, double, 4-station or 8-station units. 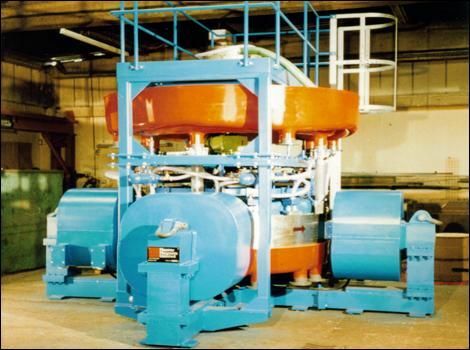 The 8-station separator has a capacity of up to 160 tons per hour. Its able to separate material from approximately 0.11 down to 0.0001 inches. In all cases we would recommend our sample testing service beforehand to determine the best criteria for separation. The WHIM separator consists of 2 annular rings carrying a carefully arranged matrix composed of triangular section magnetic stainless steel bars, rotating between a powerful electro field magnet. Each section whilst in the magnet zone forms into many very powerful magnets producing very high fields, because of the proximity to each other. The matrix is arranged so that the feed material has to pass through a multitude of powerful magnets. The feed pulp is then fed through the nozzles in the matrix region. As the feed pulp passes through the matrix, magnetic particles are attracted and held to the matrix, whilst none magnetic particles pass through to be collected. While the magnet material is still in the separation zone, it is given a light jet wash removing any trapped non-magnetic material or any material that is feebly magnetic. Finally to create product purification, the magnetic material is carried by the matrix to a point where the magnet no longer has any influence, to be washed off by more power jet wash.
Feed material is discharged from a hopper to a vibratory feeder tray. A thin layer of material is continuously transported beneath the rotating discs where magnetic particles are attracted to the high gradient magnetic zones on the discs. The rotating discs then carry these captured particles to the discharge chutes where they are released. Scrapers mounted on chutes ensure the total discharge of magnetic particles. Non-magnetic material is then transported through a second magnetic separation zone where secondary separation occurs, and is finally discharged at the end of the machine as a clean non-magnetic product.